In 1962, several military bases were established in Houaphan Province with headquarters located at Na Khang Camp (LS36) as part of a sub-military region under the command of MR-II commander, Gen. Vang Pao. Many officers served as the commander of this sub-military region, the last one being Col. Phanh Siharath who fought until he was killed at the camp in 1969. In March 1966, the Na Khang Camp was heavily attacked by the enemy. Gen. Vang Pao flew in for inspection on a US helicopter and landed at the camp’s airbase to meet with the commander of the sub-military region. He was met with heavy enemy fire that caused several severe injuries. The day before that inspection, as airplanes were dropping food supplies at the Na Khang Camp, the enemy fired canons to the airbase to prevent collecting the supplies. At night, the enemy went in to steal some of the rice supplies, and rearranged the empty bags to make them look full from afar. The next day, when Gen. Vang Pao’s landed on the runway and people were jumping to the ground, the enemy who was hiding inside the rice bags immediately fired at the helicopter. One bullet hit the aircraft and skidded onto one of Gen. Vang Pao’s shoulders. His guards fired back and killed the shooters hidden inside the rice bags. The helicopter took off immediately to leave the scene momentarily. A few minutes later, after Gen. Vang Pao was carried to a safe place, the helicopter came back and picked him up. The General was later flown on a Caribou aircraft to Oudone, Thailand and then to Hawaii for medical treatment that last about one month. He returned to Laos after his wound was healed. In the beginning of 1967, James Lair and Gen. Vang Pao went to Houaphan Province to assess the feasibility of establishing a radar station at Phou Phathee to be called LS85. In February 1969, the enemy deployed enormous forces to lay siege to Na Khang Camp and attack it heavily. This caused the loss of the Na Khang Camp and the death of Col. Phanh Siharath. Several other officers also either got killed or were taken prisoners. Phou Koum Camp (LS50), which served as back-up support base for Na Khang Camp, was also captured by the enemy at about the same time. Other military camps in the vicinity of Phou Pha Thee Camp (LS85) to the east included Muang Lab, Houa Muang, Houei Tong Khor, Houei Mar, and Ban Houei Savian –the birthplace of Maj. Kiatou Walu Vang, who was the camp’s commander and the strategic planner for the defense of Phou Pha Thee. Military camps to the west of Phou Pha Thee included Houei Kham Moune, Phou Dene Dinh, Pak Kha, Ban Phia Kham and Houei Loyh. All of those camps fell to the enemy at about the same time, on March 9, 1968. Phou Pha Thee Camp was seized on March 11, 1968. As Dien-Bien-Fu, Phou Pha Thee was the very most critical base and the most important base in the war against communist North-Vietnam because it was located on a high mountain that stood by itself, was hard to get to, and was not too far from the Laos/North-Vietnam border. 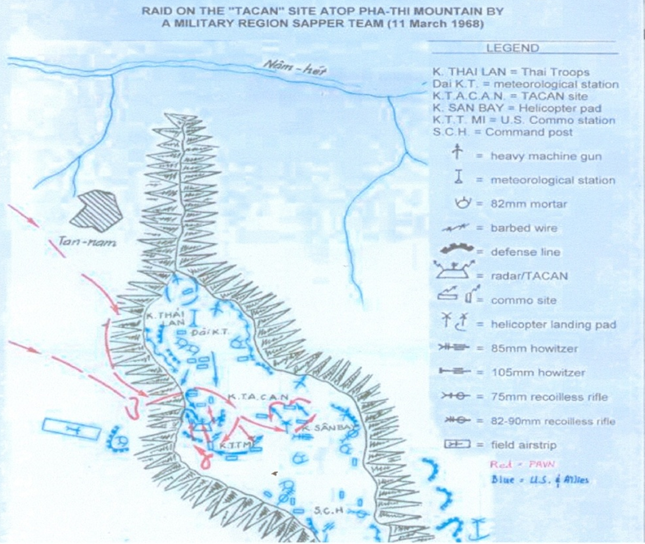 The US decided to install a radar station at the camp to 1) monitor the enemy’s movement in northern Laos, 2) provide intelligence support for the US air missions over North-Vietnam, especially around Hanoi, and 3) facilitate the search for missing aircraft and pilots shot down in North-Vietnam. Many circumstances led to the loss of Phou Pha Thee. First, there was some misunderstanding between the commander of the troops stationed on top of the mountain and the commander of those stationed at the foot of the mountain. Those commanders did not coordinated their work too well when they mapped out the defense plans for the region. Even the regional command center was not informed about that plan. Second, there was a lack of intelligence gathering and monitoring of enemy movements. Third, surveillance at the foot of the mountain was rather lamed and had many loopholes. The enemy’s elite daredevil units had no problem using the only trail that led to the top of the mountain to attack the allied troops. Fourth, there was a lack of backup troops and US air forces support. This greatly affected the morale of the allied troops, given the fact that the enemy was equipped with more powerful fire-arms and was in greater numbers than the allies. This resulted in the loss of Phou Pha Thee and 60 percent of the MR-II’s land area on March 11, 1968. Phou Pha Thee was an isolated high mountain with steep slopes and only one trail leading to the mountain top. If that trail was better defended and patrolled more frequently, the enemy would not have been able to get to the top of the mountain, which was what the enemy daredevil troopers did. [See the red map containing the enemy’s plan of attack]. Before the attack, North-Vietnam sent in three old AN2 airplanes to fly over Phou Pha Thee Camp, take photos, and drop several bombs made of 120 mm mortars. 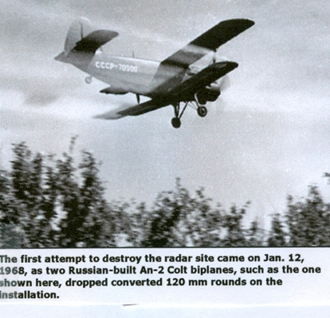 The allies used choppers to chase the AN2 airplanes and shot down two of them. The third one, which flew in first, was able to escape with the pictures that were used later in the plan of attack. In November 1967, the enemy mobilized massive armed forces to attack the allied posts in MR-II, especially in Houaphan Province. All the military camps around Phou Pha Thee were heavily attacked at the same time, making it impossible for the allies to help each other. The enemy then converged on Phou Pha Thee with troops ten times stronger than the allied troops in the beginning of March 1968. Every day, between 5 p.m. and mid-night, they would fire all kinds of heavy weaponry, e.g., 122 and 130 mm artillery, 122 mm rockets, and bombs of various sizes at the allied troops on top of the mountain and at Maj. Kiatou Va’s military base at the foothill. 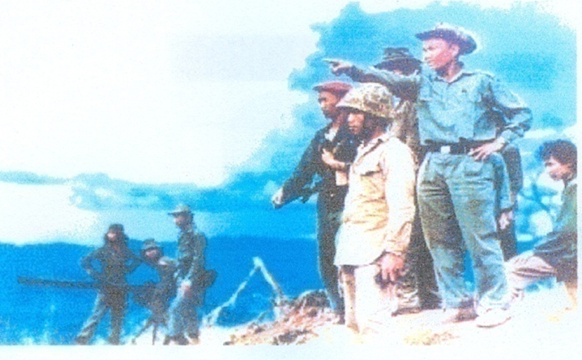 This heavy bombardment from the enemy forced Col. Soua Yang to flee to Houei Tong Khor Camp, leaving his troops behind at the top of mountain without any commanding officer. Maj. Kiatou Vang, commander of the foothill base, also decided to pull his troops out, given the heavy bombardment, the 360-degree attack, the lack of reinforcement, and the fact that his soldiers were trained as guerilla fighters (“fight and run”) and did not know how to defend ground positions (“fight and defend”). 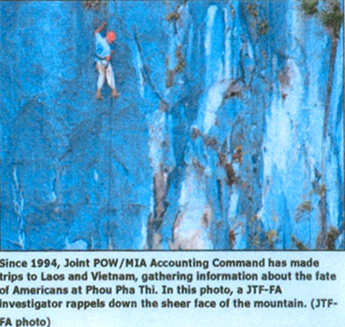 At the top of Phou Pha Thee, about 250 Hmong soldiers, about 100 Thai recruits, 17 radar specialists, and 2 CIA agents. Of the 19 radar specialists and CIA agents, 11 of them disappeared and the remaining 8 were safe. Of the 8 initial survivors, 7 were lifted to safety on helicopters and 1 was killed by enemy fire when he was being pulled up to the aircraft. No information was available on the Hmong and Thai survivors. Many of them apparently jumped to their death or got killed, because the enemy left no prisoners behind. At the foothill, about 800 soldiers under the command of Maj. Kiatou. All of them fled in all directions and were subject to unknown losses. The enemy’s losses were also undetermined, since they were the victors. It was reported later that once the helicopters had evacuated all the allied troops, T-28 airplanes and jet fighters flew in several times to drop bombs on the deserted camps. In 1965, the enemy attacked Nam Bak Camp (in northern Louangprabang Province); Saravan Province in southern Laos, Sepone, Savannakhet Province, and deployed several army divisions to Laos. Because of those attacks, the US decided to set up an Air Forces base at Oudone, Thailand to provide air support to ground forces in Laos and Vietnam, and to drop bombs on North-Vietnam. In 1965, the political situation in the US was in turmoil due to student protestations against the war in Vietnam for which the government was recruiting young Americans and sending them to fight the war in Vietnam. The tension continued to worsen as a result of new developments in South-Vietnam. In 1967, the US deployed important forces to reinforce the defense of Khe-Sanh and Hue, which were the targets of heavy attacks by North-Vietnam. Phou Pha Thee was also attacked during that time, which explained the lack of air support from the US. The enemy that took part in the Phou Pha Thee attack consisted mainly of Chinese ethnics soldiers, while the attackers of Khe-Sanh and Hue were North-Vietnamese and Viet-Cong troops. Photo #43 . A view of Phu Pha Thee and the steep way up. Photo #44 . North-Vietnam’s AN2 aircraft. The fall of Phou Pha Thee affected in many ways the political and military situation in Laos because the communists have used massive forces and received tons of ultra-modern warfare equipment from the Soviets. This resulted in Laos loosing 60 percent of its territory to the enemy, and in MR-II loosing 90 percent of its Houaphan war zone and 60 percent of its Xieng Khouang war zone in 1968. This was very scary and nerve pinning for the entire country. Photo #45 . 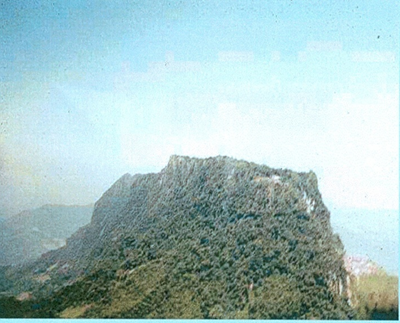 The top of Phou Pha Thee, a steep and high mountain top where the US installed a radar station in 1967 to monitor US air operations over North-Vietnam around Hanoi. Photo #47. 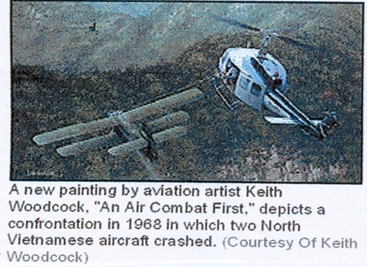 An Air America Bell 212 helicopter chased an enemy’s AN2 aircraft and shot it down. Photo #48. An AN2 aircraft was being exposed for public viewing at Long Cheng. In 1965, US jets undertook flying missions to bombard North-Vietnam and one of them got shot down by the enemy. At that time, Col. Thong Vongrasmee, commander of the Houaphan military sub-region headquartered at Na Khang Camp, was on a chopper looking for the fallen jet. The chopper was able to save the jet pilot’s life. 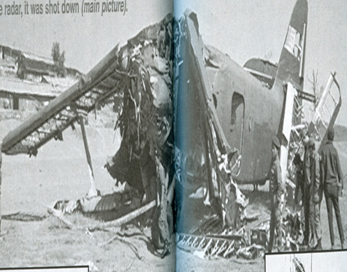 However, Col. Thong himself was killed by a sniper while hanging on the rope that was being pulled up to the aircraft. His body was flown to Vientiane for burial. Photo #49. 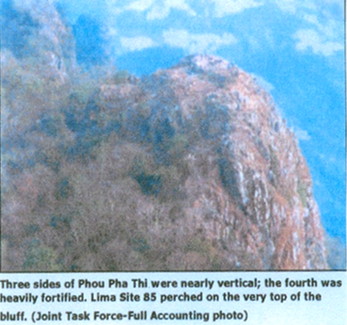 Gen. Vang Pao on top of Phou Pha Thee looking at the surrounding area and making defensive plans in early 1967. The day after the fall of Phou Pha Thee, Maj. Kiatou flew on a chopper and circled the mountain in search for the troops under his command that were hiding in the surrounding area. As Maj. Kiatou was watching the ground from the air during several air rounds, the enemy located him on their telecope and shot him to death on the chest. The fall of Phou Pha Thee led to Gen. Vang Pao losing his confidence in Col. Soua Yang. For that point on, the Colonel was never assigned any of his normal important missions — just general inspection duties in MR-II and an advisory role, if anything. 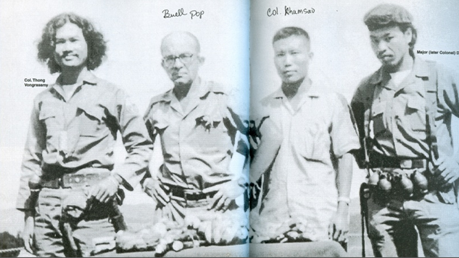 Photo #50.Left to right: Col. Thong Vongrasamy (successfully rescued a US pilot shot down in North-Vietnam but got himself killed), CIA Pop Buell, Col. Khamsao and Col. Douangta Norasing (who now resides in Georgia, USA). 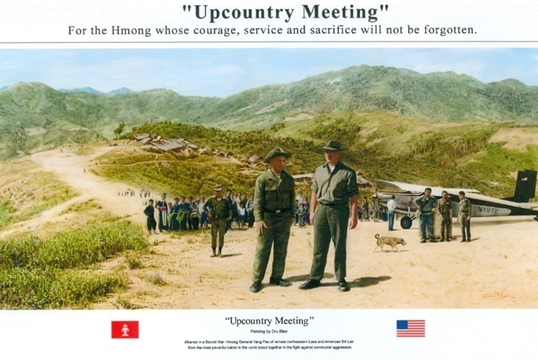 Dien-Bien-Phu was a critical strategic element that led to the regional war in the Indochina and a painful lesson for the US who decided to listen to Ho-Chi-Minh rather than its allies. It created a vibrant picture for the free world that was afraid of communism. Eventually, the US became involved in the fight against communist expansion into Southeast-Asia, and sent aircrafts to bombard North-Vietnam. The Phou Pha Thee radar base was established to monitor and improve the efficiency of those air strikes. Likewise, Phou Pha Thee (LS85) was also the most important strategic installation close to the Laos/North-Vietnam border and Hanoi. This military base created a psychological threat to North-Vietnamese, in addition to the US air operation that was already going on over North-Vietnam. Ho-Chi-Minh had to find every possible means to destroy the base to ease his army’s worries. But the US considered the war in South-Vietnam to be more important than defending Phou Pha Thee. It also felt it should faithfully implement the agreement that made Laos a neutral country, which was just the opposite of what North-Vietnam was doing. This is where history is repeating itself. Like Dien-Bien-Phu that signaled the end of the French era, the fall of Phou Pha Thee that resulted from the lack of air support from the US, was also the precursor of another communist victory over a western power. By getting involved in the Indochina war, the US was pursuing several objectives, including testing new military equipment and teaching a lesson to the communist world on how bad a war would be. Indeed, as a result of that war, the dominant communist country disintegrated on its own, and several other communist countries were able to regain their independence and/or reshape their power structure. Through the Vietnam War, the masks of the dictatorial communist leaders had been removed. Photo# 51. North-Vietnamese sappers attacked LS85 after heavily bombarding the site from 5:00 p.m. to midnight on March 11, 1968, and focusing on Thai and TACAN troops. The Hmong and Thai troops faced lack of air support from the US.